Posted at 5:16 pm on January 15, 2013 by Brett T.
As Twitchy reported, New York’s state senate late last night voted to pass a set of sweeping new gun regulations that one senator called “the toughest gun control package in the nation.” Wasting no time, today the New York State Assembly approved the package by a 104-43 vote and immediately passed it along to Gov. Andrew Cuomo for his signature. The New York State Assembly, after more than four hours of debate, approves new gun laws by a vote of 104 to 43. @NYGovCuomo: "this is not about banning guns, I am a gun owner"
The legislation expands the state’s assault weapons ban and prohibits semiautomatic pistols and rifles “with detachable magazines and one military-style feature, as well as semiautomatic shotguns with one military-style feature.” Citizens who already own guns prohibited by the new law will be required to register them with the state. The legislation also includes a so-called “Journal News” clause allowing citizens to opt out of having their status as gun permit holders publicized. Cuomo signed the bill at an afternoon ceremony attended by several mayors from across the state, including New York City Mayor Michael Bloomberg. Cuomo bill signing ceremony underway. Lawmakers and a number of law enforcement officials are here. "Common sense can win," Cuomo says. "You can overpower the extremists with intelligence and with reason." In the capital, @NYGovCuomo: "Common sense can win. Good people can win. Government can work." Then signs USA's toughest gun law. No debate, passed and signed in < 24 hrs. RT: @feliciasonmez: RT @thomaskaplan: . @NYGovCuomo has signed the gun control bill into law. That was fast. Now @GovernorOMalley playing catch-up. RT@thomaskaplan: . @NYGovCuomo has signed the gun control bill into law. Critics of the package weren’t so impressed with the speed of its passage. Cuomo negotiated bill behind closed doors with no opportunity 4 contents 2b vetted by public or even senators who first voted on the bill. 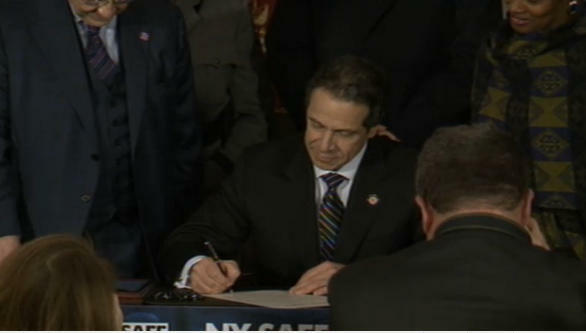 @NYGovCuomo signs NY Safe Gun Control Bill. That means New Yorkers can't go anymore to Virginia or New Jersey to buy them? @NYCMayorsOffice @NYGovCuomo @SenatorSkelos @JeffKleinNY GUN LAWS DO NOT STOP GUN VIOLENCE!! YOU AREN'T PROTECTING ANYONE!! @NYGovCuomo awesome now no criminal will ever have a gun.